Seventeen-year-old Anna has a space in her memory of a night her brain won’t let her remember, a night that devastated her life and forced her to drop out of high school. Her grandmother, Evelyn, is slowly losing her memories to Alzheimer’s. When the family moves into a forgotten house on the outskirts of Evelyn’s home town, it's supposed to be a fresh start and a quieter life for all of them. But when Evelyn starts behaving strangely in her lost moments, it’s Anna who witnesses it. It’s Anna who helps her. 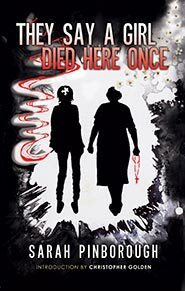 And as she’s drawn into life in the town and learns some of its recent gruesome history, she can’t help but begin to wonder if the dead are trying to talk through Evelyn’s empty spaces. And if so, what is it they’re trying to tell her? "A fine narrative, one whose blend of the familial and the strange recalls the best work of Graham Joyce." "I love a long fuse, and Sarah Pinborough’s THEY SAY A GIRL DIED HERE ONCE makes the most of letting tension and unease simmer and accumulate within the details of what seems a normal, low-key existence until the plot boils over and revelations and transformations come spilling out. And I have to say: perfect title, beautiful and resonant. I believe I am jealous." "Laced with a creeping dread that doesn't let up until the gut-wrenching ending, THEY SAY A GIRL DIED HERE ONCE is a searing, smart, and scary exploration of family, trauma, and the poisonous power of secrets. Another brilliant, blistering read from Pinborough." "Part Gothic tragedy, part ghost story, and part murder mystery, THEY SAY A GIRL DIED HERE ONCE is a smoldering story of madness and dread. Utilizing the viewpoints of three generations, this mesmerizing and claustrophobic tale sports some of the most sparkling dialogue to be found in or outside the genre. A bona fide winner." "A beautiful story, honestly told." "Moving and totally involving. Pinborough writes with vividness and emotional resonance. I couldn't put it down." "Pinborough’s writing is flawless. Brilliant work, truly top-notch." "Gritty and twisty and diabolically clever." "Pinborough’s fiction moves at a breakneck pace. More importantly, her stories have resonance. She understands how people tick. I always trust the ride, because I know I’ll wind up someplace good." "The kind of novel that takes over your life." "Sarah Pinborough is about to become your new obsession."